382 sq. metres (4112 sq. feet) of beautifully designed living space set on three levels. Double garage with remote control door opener and internal access. Large patio balconies with outdoor furniture and BBQ. 4 spacious bedrooms, 2 with ensuite bathrooms and all with sliding doors accessing balconies or a courtyard. Master bedroom with King bed, wall-mounted 32 inch flat-screen Sony TV. Ensuite bathroom with double walk-in shower, double vanities and spa bath with uninterrupted views of The Remarkables Mountain Ranges. Bedroom 2 with Queen bed, wall mounted flat-screen TV and ensuite bathroom. Bedroom 3 with Queen bed and wall mounted flat-screen TV. Bedroom 4 with twin Single beds (can convert to King bed) and wall mounted flat-screen TV. Bathroom 3 is shared between bedrooms 3 and 4. Luxurious mattress toppers on all beds. Fully serviced with towels, linen and luxury toiletries. Underfloor heating throughout and 5 heat pumps (reverse-cycle air-conditioners) – 1 in each bedroom and 1 in the central living area. Surround sound home theatre system with 46 inch flat-screen full HD Sony Bravia TV and DVD/CD player. Complimentary wireless broadband internet access. Fabulous wide, private balconies and 2 courtyards for winter sun. Large floor to ceiling double glazed windows and doors. Cable Sky HD television, including movie and sport channels. 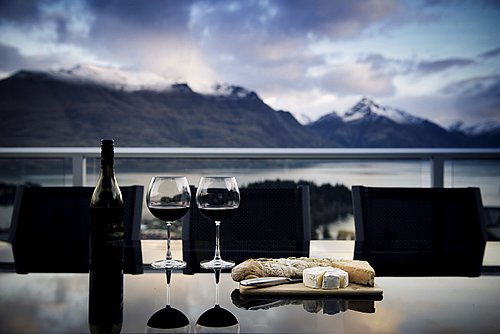 Complimentary quality bottle of New Zealand wine. 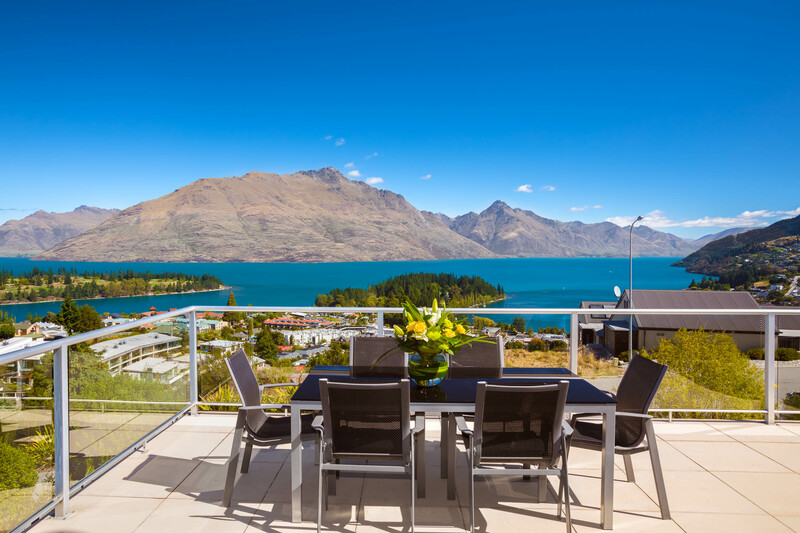 You will be personally met at the villa on arrival in Queenstown and shown around the property. Off-street and secure parking for several vehicles. Secure garage storage for ski-gear and mountain bikes [+ hose and cleaning area for mountain bikes]. Complimentary infant high chair and change table. An infant port-a-cot with mattress [but without linen & bedding], is available free of charge. Alternatively, we can hire a port-a-cot , complete with linen and bedding, for the duration of your stay. Like Your Coffee? Alpen View comes with a Nespresso coffee machine – with complimentary capsules.